Blitz Racing Radiator Cap - Pann Auto Performance - San Diego largest aftermarket automotive performance parts - What do you drive? Blitz Radiator Caps are designed to withstand extreme heat conditions and engineered to hold more pressure than those of stock applications. 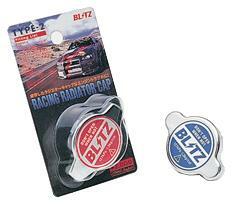 Blitz Radiator Caps are constructed of full stainless steel and utilizes a urethane seal. Available in Blue and Red each color-way is application specific for: Subaru, Toyota, Honda, Nissan, Lexus, Infinity, Mazda, and Mitsubishi vehicles.